In part 2 we mentioned the general strike that occurred in 1936 which lasted for 6 complete months in a peaceful protest against Britain's bias treatment against the Arabs when compared to the Jews. The British used force to end the strike. The violence left 195 Palestinians dead. The Arabs did not agree because part of the report speaks about a complete transfer of the Palestinians from the Jewish rule area to East Jordan in a clear ethnic cleansing idea. This year also witnessed the killing of 1000 Palestinians, 37 British army personnel and 69 Jews which clearly shows the escalation of this conflict. One of the main reasons was the deliberate British provocation to the Arabs by acts like resolving the Palestinian Arab commission headed by Ameen Al-Hussaini whom escaped to Lebanon. 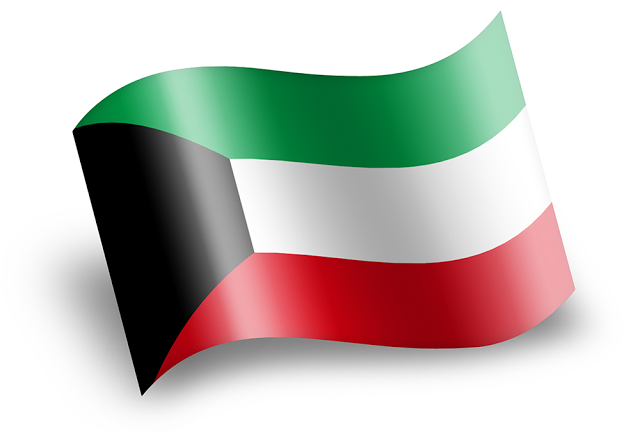 Additionally, some 5 members were deported to the Seychelles islands in an effort to remove all the political representatives of the Arabs. 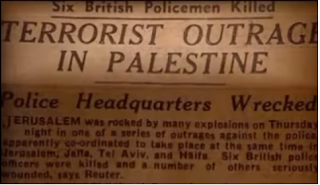 1939 the resistance leader was ambushed and killed along with the Christian Orthodox priest Gregarious Hajjar by the British forces which started a theatrical style trials that lead to the execution of 112 Palestinians. Among them was an 80 year old Farhan Al-Sadi a resistance leader. 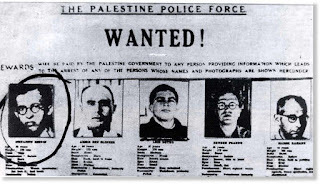 He was fasting during the month of Ramadan, thus the British succeeded in the termination of the political and resistance leaders of the Palestinians. WWII broke out and 15,000 Jews joint the British army and were trained to gain war experience in all the military fields and this was the start of the Haganah paramilitary group. The influx of Jews continued with an even greater numbers allowed by the British. 1942 a major shift in the Zionist organization location from Britain to USA as resulted from the conference that took place in the Baltimore Hotel in New York City. They had excellent relations with both the Democrats and Republicans and wanted to use that to ask for Britain to go out of Palestine as they will look after the American interests in Palestine. An eventual transfer of Arab population from Palestine to Iraq. 1945 USA emerged after the war as the Western world leader as Britain became an ex-empire. President Harry Truman the first American president after war allowed the immigration of 100,000 Jews to Palestine after the Zionist has donated 2 million dollars to his presidential campaign. 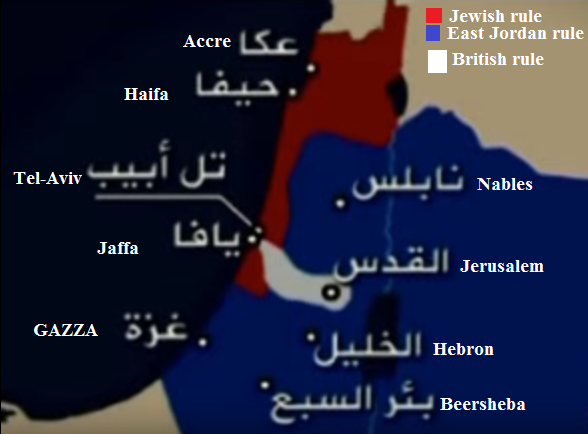 1946 witnessed further discussions between the Zionists headed by Weizmann and the British headed by the Commissioner Cunningham in March and July that year about the new borders, partitioning Palestine in a way that will ensure its vitality by including Galilee for water supply and the Negev desert and the emphasis was to continuation of the removal of arms from the Arabs. 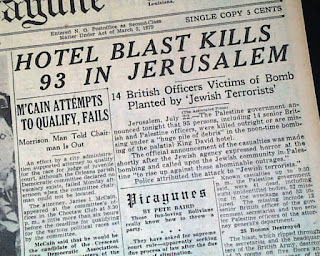 1947 The terrorist attacks continued with an explosion in the British officers club killing 16 and then the kidnapping of 2 British soldiers and executing them by hanging, this precise incident drove the British public and politicians wild. The British Prime Minister Sir Winston Churchill said after the incident "It shocked the world and deeply affected a lot of people like me who were in the past friends to the Jews and always an engineers to their future." These words sums up the disappointment of the British whom gave the Zionists Palestine on a gold platter, but even though the British army had 75,000 soldiers there yet they avoided any retaliation against the Zionist crimes . 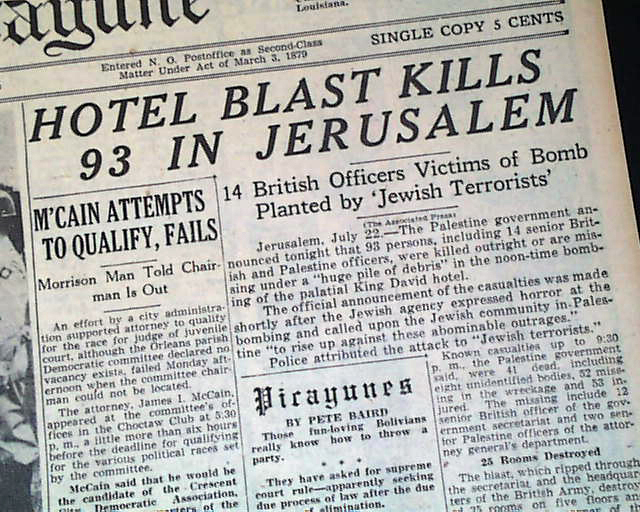 In fact the Jewish gangs carried out 500 terrorist attacks between the period 1940-1947 , and only the period between 1946-1947 169 British officers was killed while only 37 Zionists died. The ironic thing is he became Israel's Prime Minister between 1977 and 1983 and even picked up the Noble prize for peace in 1987. 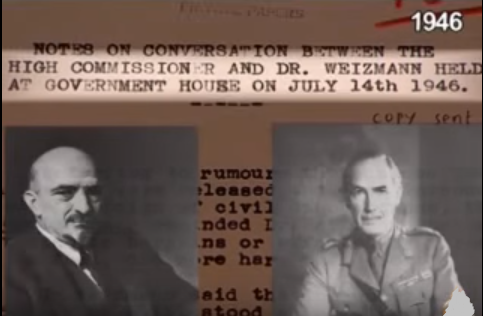 Under U.S advice the British moved the Palestine file to the UN in 1948.